The corridor boxed play centre is the smallest of the range, ideal for those with limited space. However, it could also be added to larger play centres, this is a very adaptable centre. The kit includes a plastic 255cm slide as well as plans for a wooden ladder. Ideal for smaller children this is a fun accessory for any garden. 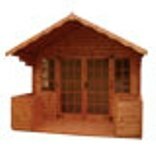 This kit includes a plan specifying what size timber is needed. This set of three hexagonal planters are a great way to transform any outdoor area. With an unusual jigsaw wood design these planters provide an interesting focal point to any space. Ideal for both large and small plants and for use all year round. These are very sturdy durable planters ideal for adding colour to areas which cannot be planted. Manufactured from FSC certified timber indicating the wood used is sourced from responsibly managed forests and pressure treated for longevity. UK Delivery: Delivery is included for the majority of the UK, however for areas such as the highlands of Scotland, some parts of Wales and Cornwall there maybe an additional delivery charge. Please contact us if this may apply to you.